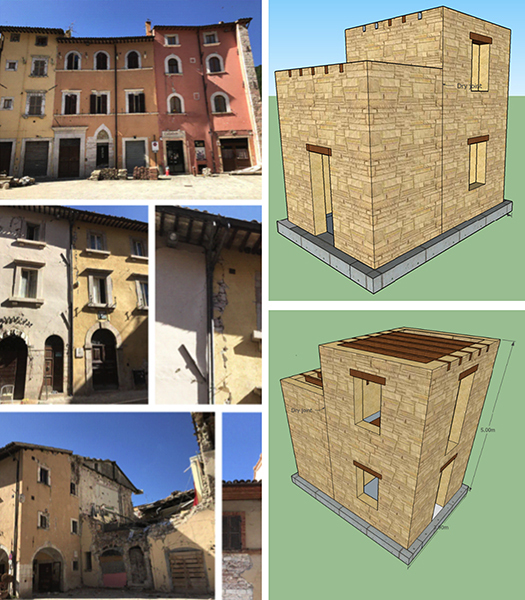 In many historical centres in Europe, stone masonry buildings are part of building aggregates, which developed when the layout of the city or village was densified. In these aggregates, adjacent buildings share structural walls to support floors and roofs. Meanwhile, the masonry walls of the façades of adjacent buildings are often connected by dry joints since adjacent buildings were constructed at different times. Observations after for example last year’s Central Italy earthquakes showed that the dry joints between the building units were often the first elements to be damaged. As a result, the joints opened up leading to pounding between the building units and a complicated interaction at floor and roof beam supports. The analysis of such building aggregates is very challenging and modelling guidelines missing. Advances in the development of analysis methods have been impeded by the lack of experimental data on the seismic response of such aggregates. The objective of this project is to provide such experimental data by testing an aggregate of two buildings under two components of horizontal excitation. One building is a two storey building, the other a one storey building. The buildings share one common wall while the façade walls are connected by dry joints. The floors are at different heights leading to a complex dynamic response of this smallest possible building aggregate. The results of the shake table test will allow (i) to investigate the behaviour of pounding masonry structures, (ii) to develop a rational method for the analysis of such aggregates using equivalent frame models, and (iii) to define performance limits for this type of aggregate structure.